On Capitol Hill, a patch of Irish green is found at the Phoenix Park Hotel, a picturesque Georgian Revival-style hotel built in 1922. Long popular with politicians, diplomats, tourists, and today’s business travelers, an $8 million restoration in 2016 infused a crisp contemporary design within its classic façade. 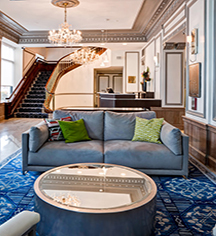 The Phoenix Park Hotel is where two worlds merge eloquently, an Old World ambiance of marble floors, Waterford crystal chandeliers, and textured woodwork, compliment distinctive contemporary styled decor and rich fabrics. Guestrooms feature custom built furnishings and luxurious marble baths. The popular Dubliner Restaurant and Pub offers an authentic Irish menu, live Irish entertainment nightly and outdoor dining. Phoenix Park Hotel, a member of Historic Hotels Worldwide since 2018, dates back to 1922. Originally known as The Commodore, the hotel was renamed in honor of Dublin, Ireland's 1,760-acre Phoenix Park. Adjoining Rooms: Adjoining rooms are available on request. Cancellation Policy: Cancellations must be made 24 hours prior to arrival. Some reservation types are nonrefundable. Deposit: No deposit for standard reservations. Some reservations may require full payment. Early Check-In/Late Check-Out: Subject to availability and fees. Extra Person Fees: $30 per night. Hotel/Resort Fees & Taxes: All reservations are subject to a tax of 14.5%. Parking: Self-parking: Not available. Valet parking: Available; $50 per night. Pet Policy: Service animals allowed: Yes. Dogs allowed. Pets allowed: No. Smoking Policy: Guest rooms are non-smoking. Outdoor smoking areas. On Capitol Hill, a patch of Irish green is found at the Phoenix Park Hotel, a picturesque Georgian Revival-style hotel built in 1922. Long popular with politicians, diplomats, tourists, and today’s business travelers, an $8 million restoration in 2016 infused a crisp contemporary design within its classic façade. 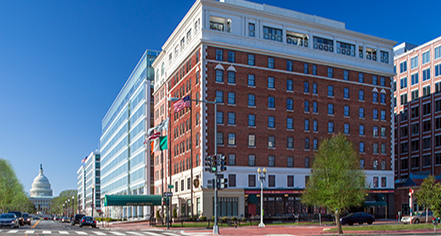 Learn more about the History of Phoenix Park Hotel .